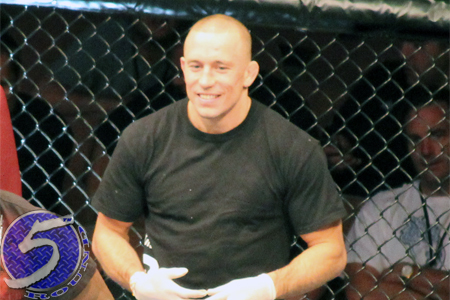 After undergoing knee surgery in December, UFC welterweight king Georges St-Pierre (Pictured) hoped to begin training at full capacity by July and resume his illustrious career by November. On Wednesday, the 30-year-old announced he has taken a significant step in the right direction. “I’m back in Montreal and full-time training! Already tried a few kicks – right knee is super strong,” St-Pierre tweeted. GSP’s post comes as welcomed news for mixed martial arts fans, especially those located in his homeland of Montreal. St-Pierre is tentatively slotted to unify the 170-pound crown against interim title holder Carlos Condit on November 17th at UFC 154, which will likely take place at Montreal’s Bell Centre. Prior to the injury, St-Pierre was originally scheduled to defend his crown against Condit at UFC 137 this past October. The baddest welterweight in bare feet hasn’t been seen since beating Jake Shields at UFC 129 in April 2011. The fight marked his ninth consecutive victory and sixth straight title defense. “Rush’s” extended absence forced the UFC to manufacture a 170-pound belt. Condit captured the fabricated title by taking a controversial decision win over Nick Diaz at UFC 143 in February. There was some chatter that Condit could take a fight against Martin Kampmann if St-Pierre suffered a setback in his recovery. However, today’s news should silence that talk for the time being.